BiglyBT is a fast, cross-platform torrent client based on the Vuze - Azureus project. BiglyBT continues from where Vuze development stalled and will always optimize the code and always release new features. The torrent client is without any commercial interests and is determined to keep the open source project alive. BiglyBT is currently available on all major desktop platforms, including Windows, MacOS and Linux. The target user are people who love to delve into the world of torrenting. BiglyBT should appeal to a wide range of users, especially the more seasoned torrent user who wants a client they can configure to their liking. 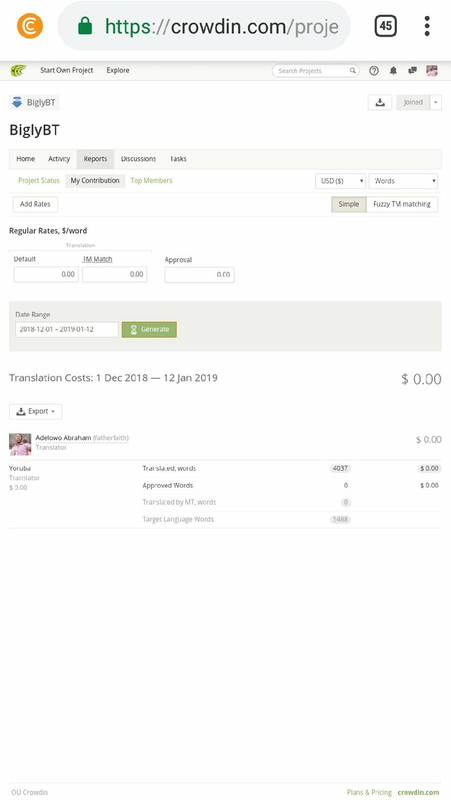 This is my third translation report on the BiglyBT project. Check out the previous reports: first and second. Working on this project is really helpful to me, as there are lots of things to learn, which wouldn't have been possible without this kind of opportunity. Honestly I really enjoyed working on the project because it has helped me know more about torrenting. It contains a lot of computing words which requires a high level of understanding in computing because the literal meaning of the words are totally different from what they mean in computing. So one needs to first understand the meaning of the words as they are being used in the computing world so as to get a perfect translation. All the words were translated from English to Yoruba Language except for few words that have to remain like Torrent, IP, peer, Keystore, Swing, Interface and so on. I tried to maintain consistency while ensuring the best semantics translation that perfectly carries the message contained in the source language is conserved. The project's translatable texts are a total of 27,171 words and in this session which is my third session, I was able to translate 1,358 words making an overall translated 4,037 words (14.8% of the total). The project should be completed in 20 sessions approximately (~17 left). I translated a total of 1,358 words from the source language to a total of 1,888 words of the target language as estimated and shown in the picture above. Hello @fatherfaith, thank you for this contribution. This is an improvement on your previous works. I am impressed.